How they knew that I loved all of these shows is beyond me and the way that they packaged this? Brilliant. I just hope that I’m not the only person who watched this. I also hope that somehow some of the kids from “My Super Sweet Sixteen” end up on Juvies. Here’s to wishing! Ok, so just when I thought this show was getting too serious, the one girl in this episode (I’ll call her “slasher”) started to talk about how she wanted be a singer and that she was supposed to be on American Idol, but she was in “Juvie” instead. Then she started singing. I immediately thought, “Ok, now there’s the MTV reality show style I love!” Although, this reality show doesn’t seem scripted and that makes me nervous. So what do these kids do while in this “cops for kids” prison system? Well, they get to walk around outside, the girls seem to constantly braid their hair, the guys work on their interviewing skills (really? ), they all give themselves lice-treatments, they’re not allowed to climb trees (random), and they get filmed while doing all of this. It’s a real win-win. 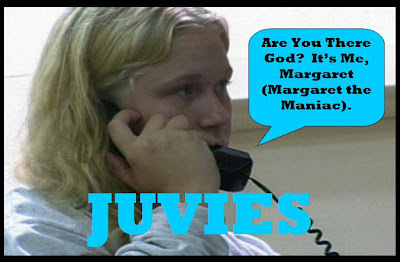 For me, Juvies was pretty serious overall. I would have liked to see some “prison fist fights” and wild kids screaming, “you don’t know me, you don’t know me” as they look into the camera. I was a little let down there, but I’ll let is slide. I’m hopeful for next weeks episode.